Update, 2/15/2017, 4:15 p.m. EST: A grand jury declined to indict Nielsen this morning. KSTX reports that footage from in-stadium cameras played a large part in the decision. Heath Nielsen is an associate athletic director at Baylor and he’s in charge of managing the athletic department’s public image, which has been justifiably tarnished over the past year by a series of high-profile sexual assault allegations that the university largely suppressed by making life hell for women who reported them. 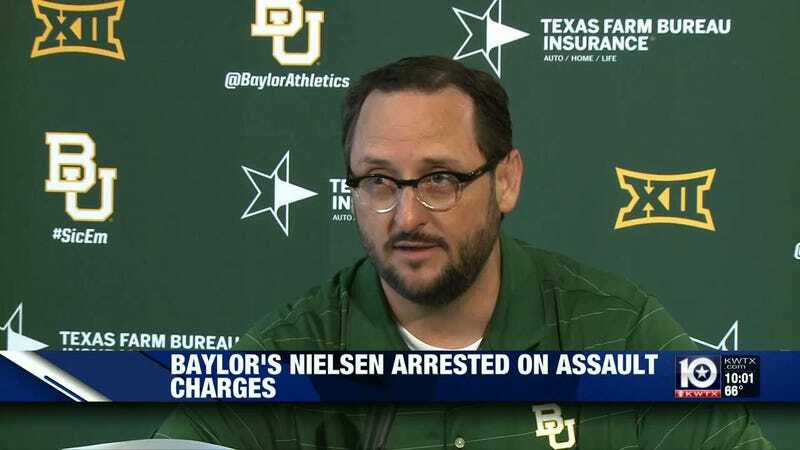 Nielsen was arrested two weeks ago, after Baylor’s Nov. 5 loss to TCU, for allegedly assaulting a reporter, so it sounds like he’s really quite committed to embodying Baylor’s public image in his own life. As KWTX reported this evening, Nielsen approached James McBride, a reporter for a small local paper called the Texas Blaze, on the field after the game and allegedly grabbed him by the throat. McBride told KWTX that he was trying to take a photo with a player, when Nielsen came up to him and yelled “No interviews on the field!” McBride said that Nielsen tried to “tomahawk chop” his phone out of his hand, after he which he grabbed him by the neck and pulled him back. When McBride and the player asked Nielsen what the problem was, he replied, “He’s abusing his privileges,” ‘the affidavit said. The injuries were photographed, the affidavit says. Nielsen was booked in McLennan County jail on a charge of misdemeanor assault with bodily injury. He’s currently out on bond.